New Liturgical Movement: A Review of "The Dorchester Review"
While not liturgical, I know the NLM readership is a diverse audience of broad interests, ranging from other areas of theology to matters political and historical. 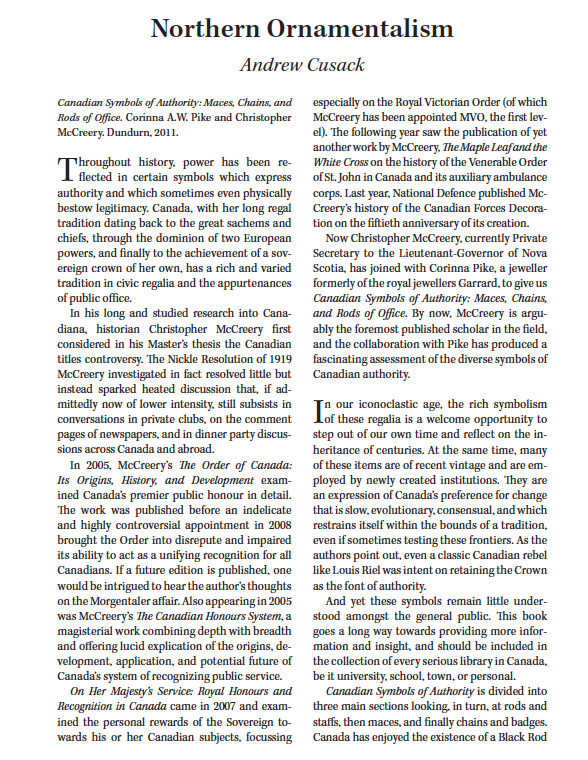 As such, I wanted to make mention, particularly for our Canadian readers, but also for readers in the United States and elsewhere, about a new, quarterly journal coming out of Canada that I think will be of some interest, The Dorchester Review. I first learned of The Dorchester Review by way of Andrew Cusack in his piece, A Breath of Fresh, Northern Air. "Just as no one can live without pleasure, no civilized life can be sustained without recourse to that tranquillity in which critical articles and book reviews may be profitably enjoyed. The wisdom and perspective that flow from history, biography, and fiction are essential to the good life. It is not merely that “the record of what men have done in the past and how they have done it is the chief positive guide to present action,” as Belloc put it. Action can be dangerous if not preceded by contemplation that begins in recollection." 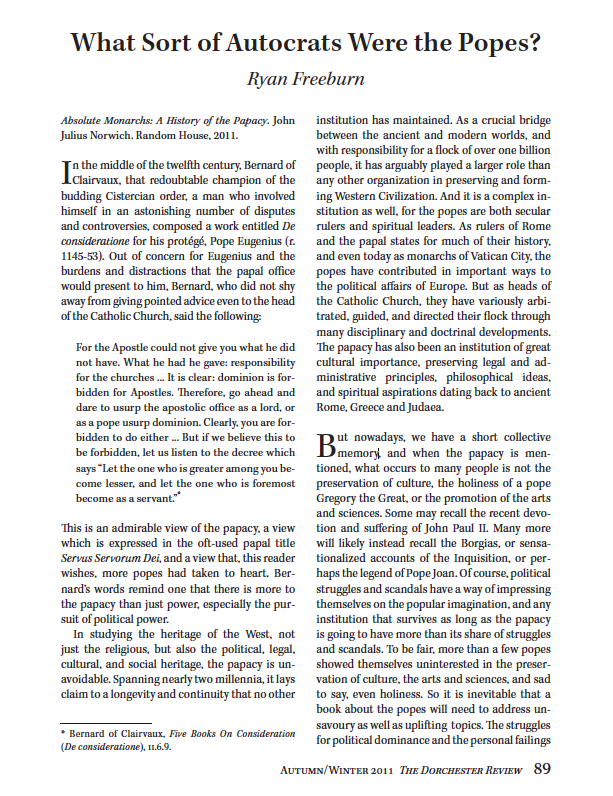 The endeavour of reviewing books, the editors acknowledge, has too often been reduced either to brief puff-pieces in the Saturday insert of the local paper or more high-minded but uncritical praise of like-minded academics for one another. “There are too few critical reviews published today, particularly in Canada, and almost none translated from francophone journals for English readers.” As someone with a lifelong love of Quebec, I am relieved that finally there is a review in my own language willing to take Quebec seriously. They also forthrightly explain their rejection of the narrow nationalist perspective that has been on the ascendant in Canada throughout the past century, especially since the foundation of The Canadian Forum. The Dorchester Review effectively throws Canada’s doors open to a more reasoned understanding of the country’s relationship with Europe (Britain and France particularly), America, the Commonwealth, and the world. The Dorchester Review is founded on the belief that leisure is the basis of culture. Just as no one can live without pleasure, no civilized life can be sustained without recourse to that tranquillity in which critical articles and book reviews may be profitably enjoyed. The wisdom and perspective that flow from history, biography, and fiction are essential to the good life. It is not merely that “the record of what men have done in the past and how they have done it is the chief positive guide to present action,” as Belloc put it. Action can be dangerous if not preceded by contemplation that begins in recollection. Every historian and every writer has an agenda, frequently political and often unadmitted. To the entrenched complacencies of much professional scholarship and literary journalism, one antidote is corrective and restorative history, engagingly written. There are too few critical reviews published today, particularly in Canada, and almost none translated from francophone journals for English readers. It also remains likely, as Orwell put it, that, “The great majority of reviews give an inadequate or misleading account of the book that is dealt with. ... The best practice ... would be simply to ignore the great majority of books and to give very long reviews — 1,000 words is a bare minimum — to the few that seem to matter.” At the Review we shall praise the good books and assail the bad. The Dorchester Review has no political agenda but a robustly polemical one. If the mandate of The Canadian Forum at its inception in 1920 was “to trace and value those developments of art and letters which are distinctively Canadian,” then the mandate of The Dorchester Review is very nearly the opposite. The nationalism that began with the 1920s centre-left has in some ways produced a narrowing effect on the country’s imagination, squeezing out elements of tradition and culture inherent to Canadian experience that fail to conform to a stridently progressivist narrative. We confess another potentially unpopular belief: that, at its core, Canada’s strength and advantage — that of a British liberal society with a strong French national enclave, resilient aboriginal communities, and a vital pluralism born of successive immigrant arrivals — would be void if polemically separated from its European, Judeo-Christian and Classical traditions, which is another answer to: why history. We are conscious and grateful heirs to an invaluable if variously pressured tradition of free expression and criticism that is found and defended with particular seriousness in the North Atlantic societies, and this we think should be recognized, protected, and always enhanced. In our choice of a moniker and historical patron we take the name of a bewigged British soldier, an astute and unapologetic colonial governor from the pre-democratic era, in order to underline that history consists of more than a parade of secular modern progressives building a distinctively Canadian utopia. That the King praised Sir Guy Carleton, 1st Baron Dorchester, as “a gallant and sensible man” is no small recommendation. Finally, we gratefully acknowledge Toby Buchan’s acceptance of our invitation to serve as honorary patron. As an editor, publisher, and illustrator in England he is known as Mr Buchan. We approached him, however, as the 4th Baron Tweedsmuir of Elsfield and grandson of John Buchan, the great storyteller, historian, and 15th governor general of Canada. In that capacity, Lord Tweedsmuir graciously accepted. In the pages of this edition, notice can be found of the handsome new edition of John Buchan’s classic thriller, The Thirty-Nine Steps, with a fine introduction by his grandson, our hon. patron. In general the Review will not take editorial positions unless grievously tempted. Four of our five contributing editors have written articles for the first issue: Randy Boyagoda, C.P. Champion, Phyllis Reeve, and John Robson, who bring varied literary and editorial talents to the cause. We are proud to carry articles by Gil Troy, Sam Menefee, Barbara Kay, Graham Stewart, Greg Melleuish, Conrad Black, Adam Chapnick, Mathieu Bock-Coté, and many others. We welcome submissions as well as letters and comments, encourage readers to take out a subscription, and, when necessary, disagree with us enthusiastically and intelligently! Journals as these need support and encouragement. So might I encourage those of you interested to subscribe. It is rather reasonably priced.